Dr. Brett Steenbarger from Traderfeed recently put up a series of bonus posts covering how he calculates price targets. I made a Thinkscript that plots them for you according to the methodology in his posts. Dr. Brett says the posts are only available for a limited time, so check his links while they are still there. fivedayrange = yes or no. If yes, then it uses a 5 day average value of the daily range. If no, it uses only the prior day’s range. RS1coefficient = range multiplier for spacing out the R1 and S1 levels. RS2coefficient = range multiplier for spacing out the R2 and S2 levels. RS3coefficient = range multiplier for spacing out the R3 and S3 levels. These coefficients are a multiplier on the range value to use (either prior day or 5 day average as chosen by the first input). Dr. Brett says that these numbers are found by correlating to past data. For ES/SPY, he uses 0.75, 1, and 1.25 for these numbers. 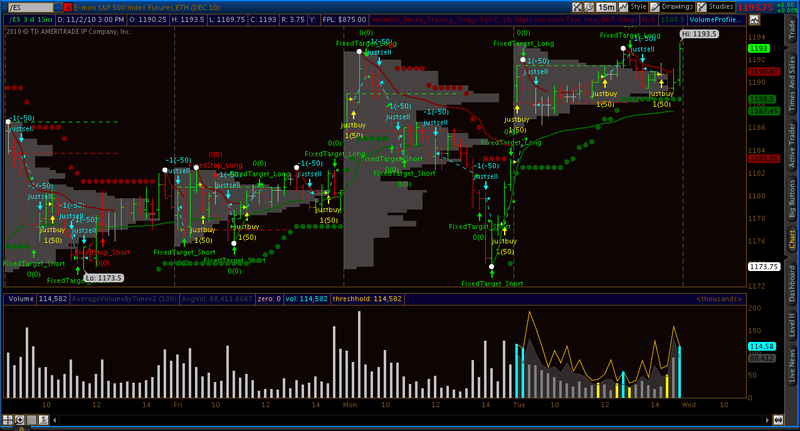 The script will plot the pivot, the levels R1-R3 and S1-S3, the VWAP, and the prior day’s high and low. If there’s enough demand, I could also make an excel backtesting template to get the correlation stats that he uses to tune the targets to the volatility of the particular symbol you are trading. Download the free script “Dr_Brett_TargetsSTUDY.ts” from “Released Thinkscript Studies” at my Google site.